Dev saab entered the warm and nicely furnished room. He wasn’t surprised to see a very familiar and smiling face. It was his voice, the voice that had sung so many of his romantic songs, sad songs, happy songs and patriotic songs. In fact he had been wondering who was the most likely person he would meet when he walked in here. They both had a hearty laugh, and then began that wonderful tete-a-tete that they must have had so many times while creating those perfectly magical and heart warming numbers for numerous films. They talked about Kala Bazaar and Kala Paani. They talked about Khoya khoya Chand and Hum Bekhudi mein tumko pukaare chaley gaye…. “laakh mana le duniya, saath na yeh chootega, aake mere haathon mein haath nay eh chootega” to which Rafi Saab with all humility bowed his head and smiled and said, “aap abhi bhi bahut achha gaatey hain”. They travelled down memory lane, reminiscing about Teen Deviyaan, and Tere Ghar ke Saamne, and Sharaabi. Each song they talked about having worked on together showed the bond, the understanding, the respect and the utter devotion to their craft, each one of them a master of his work. Just then in walked a buffoon like character, dancing, singing, jumping, yodeling and running all over the place. And instead of feeling disturbed or getting peeved at their low voiced discussions getting interrupted, Rafi saab and Dev Saab smiled very big and warmly welcomed the great Kishore Kumar of Khandwa. And then began a riot of songs, jokes, anecdotes and so many things to share. This kind of camaraderie was of the old world, not so visible today. On earth. The ultimate situation took place when they were joined by Sachin Dev Burman Da and composers Shailendra and Sahir Ludhiyanvi. This is what heaven is made up of. Of great actors, great singers, great composers and great lyricists. And together they weave this intricate carpet on which all of us travel to our destinations of fantasy. But I know that he was always one person who didn’t believe in staying at one place. His last wish to have his final rites done away from his homeland was apt- may my countrymen never see me dead. You will always stay alive, Dev Saab. In our hearts, and all around us. This entry was posted on Sunday, December 11th, 2011 at 3:12 pm	and is filed under Meri Awaaz Suno. You can follow any responses to this entry through the RSS 2.0 feed. You can leave a response, or trackback from your own site. Superb imagination. I wish I were there in the ‘Mehfil’. sunil ji.. at delhi for the mohd rafi group u have to meet mrzorawar or mr ashish kapoor . they are on facebook account. besides pls see rafibook.com too as the administrator is based in new delhi..
Can i get the contact of administrators in Delhi or representatives of Rafi foundation in Delhi. so that we are in contact with them also . I too am facing problems in listening to rafi songs on this site . Pls check . thank you very much. your encouragement keeps me going!!! a message for the moderator through this post- until yesterday i was able to listen to a continuous stream of songs of rafi saab on this site. i am not able to hear it now, even though i kept adjusting the volume controls etc. could you please look into it, sir? each song has been a treat, and i have them playing on my system whenever i switch it on…..
you have dev sahab n rafi sahab’s blessings too – have a blast on the 25th. please send us vedeo recordings of same via email. you have rightly put it – the youth will learn – how the humans in yester years nurtured good values and familly systems – respect to elders – respect to talent and icons. highest levels of sincereity and simplicity in living. I don’t have knowledge about programmes is Delhi on 24th Dec. But, we, in Hyderabad have our hands full on 25th. It is the 4th year running that we will be celebrating this event. The venue is an an ethnic rajasthani village-dhola ri dhani- on the outskirts of Hyderabad, where we will all assemble from 10 am for a day long singing session. This year, because it is the 86th birth anniversary of the legend, we will sing 86 songs-solos and duets-through the day. each succeeding year, we intend to increase it by one song. This place is a venerable picnic spot and the walk-in holiday crowd too will be an additional incentive for our singers. Through our such performances in the past, we have met some outstanding, well-meaning Rafi-bhakts who are our coveted members now. Just Rafi Saahab’s name is enough to draw sincerity, you see! We look forward to good wishes from all of you for the smooth conduct of the programme. thank you once again for your very warm and encouraging feedback. yes, the loss of great people like Rafi Saab, Dev Saab and Shammi Ji leaves a massive void. the comfort for us is in the wealth they have left behind for us, to share with today’s youth. and to show them how people lived their lives then. the feeling of comfort and consolation is akin to one of my all time favourite books called The Five People you Meet in Heaven by Mitch Albom. it is very true that people are missed more when they are gone. but we do have their legacy and their work to cherish forever. nice one achal ji, sunil, padmanabhan all friends…. thanks for the lovely contributions. That was a nostalgic and breathtaking account. In a sense, it was more real than the reel world of today, when an artist’s existence, survival and career graph is directly proportional to the manipulations and maneuverings that he or she undertakes to remain at the top. They were true artists; they drew inspiration from each other, could work as a team, respected each other and shared their joys and sorrows. Dev Anands don’t die, as also Rafi Saahabs. They simply assume other invisible but omnipresent forms. Each time some gentleman stands straight from now on, you will miss Dev Saahab – he would have carved out a seemingly uncomfortable but strikingly handsome pose even in that basic posture, his mischievous eyes or a defiant smile giving the situation a newer meaning. And these memories no longer get silenced by death, they survive to linger on beyond time, beyond horizons. You will see him day in and day out in those Shahrukhs, those Hrithiks or Amir or Salmans. Only to realize – and rue – what a poor copy they make of the original! Your write up conjures a feeling of physical loss and as also the ‘visions’ of life ‘hereafter’. For people like us who have been part of the active past, are witness to a very ‘loud’ present, it is this ‘vision’ which gives hope and thereby meaning to life after death. Thanks Achal, for such an imaginatively constructed scenario. Dear Binu Ji It is sad to note that we are loosing our heroes in such a way . I don’t see any new Hero taking their place or build that kind of aura. I am worried how the legacy of these heroes will be carried forward by their sons. It was nice to hear from Suniel Anand son of Dev anand that he will carry forward the work of Dev saheb and his production house Navketan. I pray to god for his success. As Shahid Ji son of Rafi saheb is carrying forward the legacy of Rafi saheb same way these people will also do. Also since we are nearing 24th Dec the birthday of our beloved rafi saheb I want to know if there are any prog. going to be held in Delhi so that we can see our future and current generations singing Rafi saheb songs and our next generation to know know Rafi Saheb work and carry it forward. Yes, I liked the way this beautiful scenario was created. It is comforting. It did happen, this is how the ‘real’ artists interacted – and the time was magical. It seems so simple and yet it does not exist anymore. It is a time that some of us crave for. Who knows whether we will ever be part of it again. Because somehow that innocence, that simplicity and respect which was part of life and relationships then are just not there anymore. It’s all money, artificiality and imitating the crude things about the west nowadays. We can only achingly hope (because we just don’t know) that there is a place somewhere where similar people go after leaving this world. Where the same magic and beauty of certain times in this life are repeated. 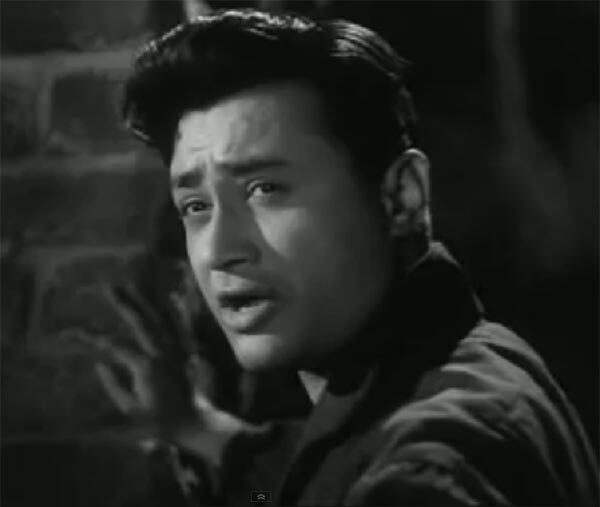 Dev Anand was my very first heartthrob from the movies, even though agewise he was from another generation. But so very attractive, so romantic, so dashing and handsome – and Rafi Sahab’s songs picturised on Dev – what can one say…? Tere Mere Sapne is one of the most romantic songs ever. In fact, all the Guide songs. And think of the way Rafi Sahab said “Yeh aankhein” in the song “yeh aankhein Uff yun Ma” And Khoya khoya chaand, for me the most special Dev Anand scene. Running in that carefree, happy way across the meadows in the twilight. But one has to stop dreaming. a chance to meet Dev Sahab never did materialise – I had planned to sing “Aaj phir jeene ki tamanna” in his honour. But it did not happen. Sach toh yeh hai ki aaj phir jeene ki nahi balke aaj kuch marne kaa iraada hai…..kyonki ek ek karke sab hamarey heroes us paar chale jaa rahe hain. Thanks Achal, for an imaginative and creative write up. As I said, it was comforting to envisage it specially knowing that this is how it must have been. You did a good job of re-creating it. dear friends, thanks very much for your compliments. when such great people meet up, surely the mehfil would be truly amazing and magical!! jagdish bhagchadani ji, your write up is very interesting. i always like listings because the exercise is so difficult. there are so many songs to write about !!! Wonderful write-up… great imagination. The great camaraderie that you mentioned is not a fantasy; it actually existed on earth during those days. The scene you conceived and constructed could actually have happened, considering the respect all the participants in the mehafil you mentioned had for each other. Kudos to you for such creative concept expressed through this excellent write-up. What a great article…makes you think of all these greats together and creating “MUSIC”- the thing that unites one and all. Hope one can see them all up there. you always come up with innovative themes and write ups occassionally when someone leaves the world. Like I read your last write up on Shammi Kapoor. Dev Anand and Rafi Sahab the combo gave us many great hit songs. you almost touched those songs in this essay in a unique manner. Please keep on entertain us with your magical essays about the legends. Rangaji: Loved reading this and this has fuelled my urge to be with all these greats in God’s Own Country.It is rather unfortunate to us old-timers brought up amidst all these stalwarts,that while one-by-one they are all going away there are no replacements to satisfy our craves. Thanks a lot for taking us on a wonderful journey ‘abroad’. Hi Achal, Thanks for such a beautiful portrait of Heaven.. till now it was very sad to think that all these personalities are no more on this earth to create magic but your article brought a kind of relief that…”well we have a lot of magic waiting for us at d other side of life” :).. Very imaginatively written !! The world above is surely getting more star-studded nowadays and it just received one of its brightest. Between Dev-KK-Rafi, we have the most incredible star group and your write-up, like a powerful telescope, enabled me to get a glimpse of its luminosity. Wonderful article, I am still fantasing about the sceanario you created. Thankyou sir. Still wondering about the picture with rdb, dev and rafi sahab. I could be wrong but I don’t remember rdb using rafi sahab for dev anand. 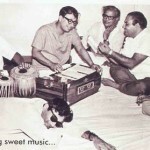 The last time rafi sang for dev was one song in gambler which was under the senior burman. After that it was kishoreda all way, till one song of Manpasand under Bappi Lehri. Can someone shed some light on this? gurujee – aapney aapkaa dil kholkey rakh diyaa hai aur hum sabh yahaan padhkar thivrr anandmai hokar – uss behtereen ghatnaa kaa luthf uthaathey huey swarglok jaa pahundchey hain. yes rangajee – such a gathering of creating film people could only happen in the heaven. you are right when you say – this does not happen on earth. humans have no value and humanity is long lost in oblivion. a sure shot rangajee style which is highly personalised and in possession of its copyrights. your write up truly satiates every music / film lover even if he is not a fan of dev sahab. well, i doubt if anyone ever says he does not like dev or is not his fan…..
keep writing rangajee – the members of this beautiful website – salute you and request you to keep drumming us with many more such dilsey write ups.